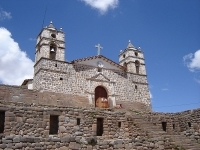 Located high in the mountains of the Southern Sierra, Ayacucho (also called Huamanga) has been closed off to the rest of the world for much of the last two decades. In the 1980s, a terrorist group known as Sendero Luminoso (The Shining Path) took over the town as their base and held power for more than two decades. Only recently liberated, Ayaucho is a relatively unknown gem in Peruvian tourism, which is attracting more and more visitors. The region is beautiful but one of the poorest in the country, and there is some concern that extremist groups could once again become a problem if living conditions are not improved; however, for the moment the city is peaceful and welcoming of tourists. It's a quaint colonial city with a number of pretty churches - 33 churches for the 33 years of Jesus' life. Ayachuco is also a great shopping destination, as many Peruvian souvenirs are made here. In the picturesque hills just beyond the city there is a giant white obelisk commemorating the final battle for independence where the Peruvians defeated the Spaniards. Vestiges of ancient human settlements, more than 15,000 years old, have also been found close to the city, at the site of Pikimachay. The best time to visit Ayacucho is around Easter, when the city's carnival celebrations are in full swing.